A week of having to eat only unleavened bread (matzah) poses a challenge to all home cooks. Every year I discover though, that there actually is something to do with the stuff, besides the good old matzah brie (an egg and matzah scramble). A few years ago I shot a promotional Passover magazine sponsored by the Israeli meat company,“Adom-Adom”. 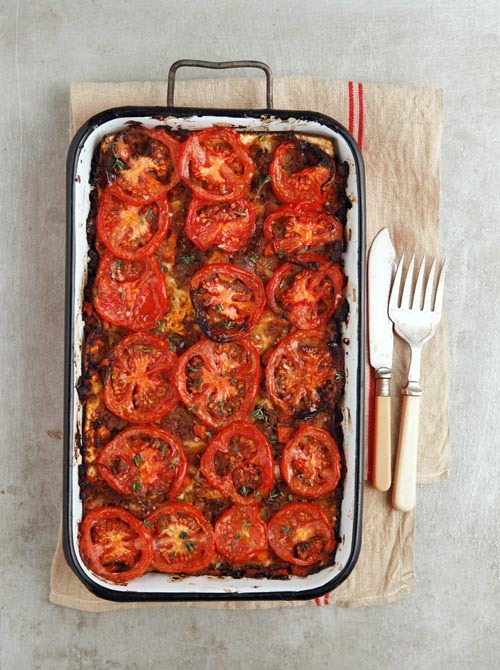 The chef of the company, Avi Shteinitz, created a surprisingly tasty ragu matzah lasagna. Since then, it’s been in my Passover repertoire and I always get major compliments, the most prominent being the revelation of how similar matzah becomes to lasagna noodles in texture once baked. For this holiday I decided to create a dairy version of the matzah lasagna using the wonderful seasonal greens available during this spring season. 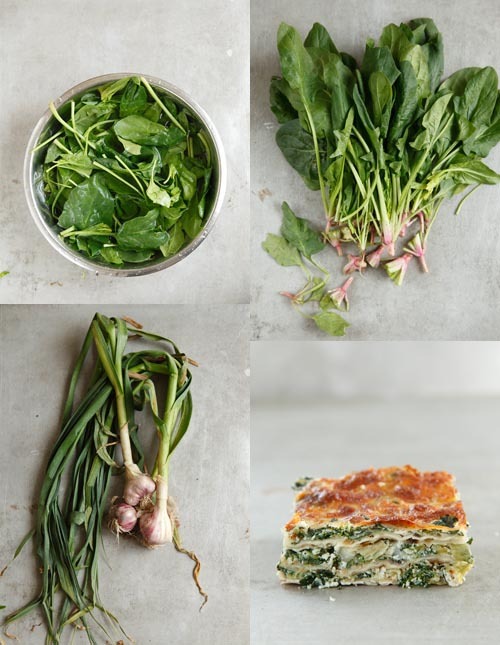 Spinach leaves, fresh garlic and leeks found their way into the lasagna, along with fresh ricotta and mozerrella. It was obvious that the veg lasagna version would be just as delicious as the meat one. And it was. Last year we posted a recipe for a gluten free chocolate cake which is a perfect recipe for this Passover holiday. Check out our chocolate covered matzah from two years ago. Happy Passover- and Easter too! In a large saucepan, heat the olive oil and add the onions, garlic, carrots and celery and cook on medium heat for about 7 minutes, until the vegetables are translucent. Add the meat and cook until brown. Add the white wine and cook for another 5 minutes. Add the canned tomatoes and tomato paste. Bring to a boil and add one tablespoon of thyme leaves. Lower heat and cook, uncovered for 1½ hours. Season with salt and fresh ground pepper to taste. Prepare the lasagna: brush the baking dish with olive oil. Place one layer of matzah on the bottom of the dish, so that it is completely covered. Pour over about 2 cups of the ragu. Repeat with another layer of matzah and then with ragu. Continue until you have 4 even layers, finishing with a layer of ragu. Evenly place the sliced tomatoes over the ragu, and sprinkle over the remaining tablespoon of thyme. Season with salt and pepper. Bake, covered for 20 minutes, and then remove cover and bake for another 20, until browned. Heat the olive oil in a large pan, add the leeks and cook over medium heat for 5-7 minutes, until softened. Add the garlic and cook for another 2-3 minutes. Add the spinach (in batches), and cook until completely wilted. Season with salt and pepper. Remove from heat and allow to cool for 10 minutes. Once cooled to touch, coarsely chop the mixture. In a large bowl, mix together the ricotta and half of the mozzarella. Add the chopped spinach mixture and season with salt and pepper to taste. Prepare the lasagna: slightly wet the matzah with water and place one layer of matzah on the bottom of the dish, so that it is completely covered. Pour over ⅓ of the spinach ricotta mixture and sprinkle over a bit of mozzarella. Continue until you have 4 even layers, finishing with a layer of the spinach ricotta mixture. Sprinkle over remaining mozzarella. Looks delicious! I can’t wait to try it! For some reason I have never thought that matzo crackers could stand in for lasagna noodles even though I have eaten them dipped in tomato sauce before. I wish this recipe included nutritional information. I’m diabetic and take short-acting insulin based on the grams of carbs in the meal I’m about to eat.